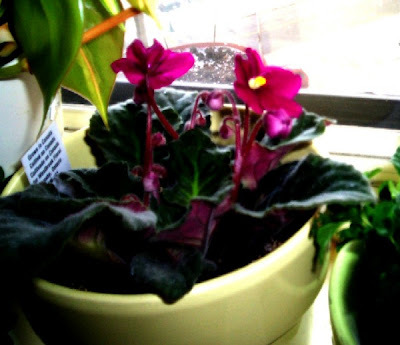 This little African Violet is sitting on my window sill, in a little yellow pot. It's blooming like crazy right now which is nice to see because I've had it for about a year and this is the first time it's had flowers since I bought it. Not sure why now - I'm not doing anything different. 47. The loonie Speedcat Hollydale and his AMAZING Double Sun Photo !! And I love the tiny spot of yellow in the middle of the violet =) I wish they'd grow here on my side of the world. Too hot for a dainty bloom to flourish. Mine do that too, suddenly burst into bloom. I like the little splashes of yellow. Plants have their own moods...yours looks lovely!! The conditions must be just to its liking. If you got it a year ago blooming, it may be the time of year it likes to bloom. You are doing something right! My FIl used to have an african violet but it died. Yours look so healthy. I love both, the flowers and the pot..
My first time to join here and loving it. My mom used to have many African violets, blooming all the time. Mine just sit there with their pretty leaves. Rarely bloom. Cute yellow pot and the flowers too. You've managed to get all the light and heat conditions the way an African violet likes them. That spark of bright yellow is wonderful against the magenta bloom. Very pretty. Very pretty and cheery for a winter day! I have a pretty yellow up too! !